KORG M1 - No sound / Low battery indication. SOLVED! Suddenly my korg M1 stopped producing any sound from all outputs, when triggered by its own keys or by an external keyboard. Also there is a "low battery" indication that does not go away even when i change the battery with a new one. Everything else seem to operate ok. I checked the yahoo group of M1 and I found out that others users had the same problem but unfortunatelly I did not find any solution. 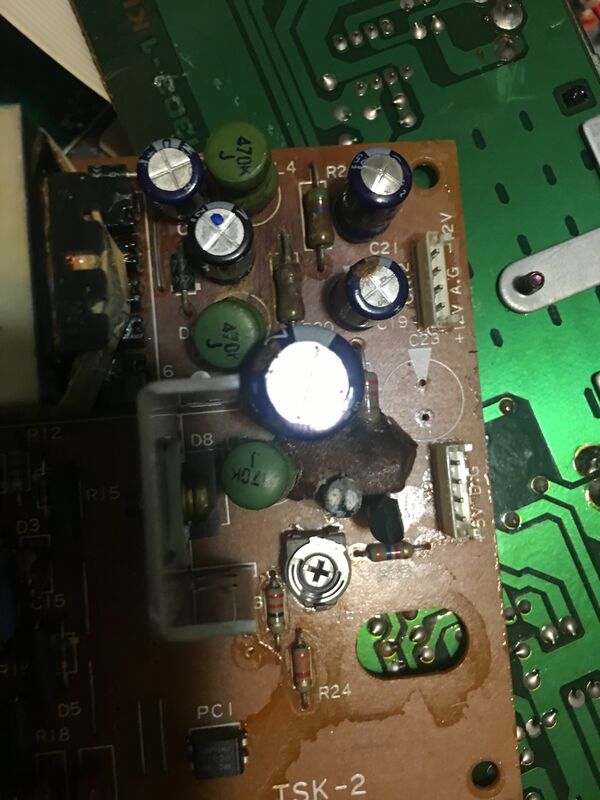 I thought that maybe some electrolytic caps were dead, just like the common korg O1 "no sound" issue, but I have found no evidence of caps leakage. I checked all cables, checked continuity, used deoxit on connectors, checked for cap leakage, changed the battery but the problem persists. Has anybody else experienced this issue ? Any thoughts about what to check , would be appreciated. I have the service manual if anybody else is interested. Last edited by Yekuku on Sat Jan 23, 2010 1:33 pm, edited 1 time in total. Try reloading the factory settings/patches via sysex. After the battery dies, the internal memory contains gibberish. I have disconnected the power supply from the main board and I have found out that the cn9 connector outputs 7.9 Volts instead of 5V and the cn12 connector outputs 17 Volts instead of 12V. Could this be the cause of the problem ? Any thoughts about what else might be the causing this problem ? Those voltages don't look right, but you're measuring with no load on the power supply. Try measuring the voltages with the supply connected to the main board and see if they're closer to spec. If the power supply is out of spec, it's possible that it fried some components on the main board. But the CPU seems to be working fine if the display, buttons, midi etc. work. Also, if the PSU voltages are high, it could make the battery voltage "seem" low in comparison, causing the low battery warning. Are there any trimpot adjustments on the power supply? I have connected the mainboard back to the psu and measured 4.99V for pins 1-2 of the cn9 connector and 12.05V for pin 1 of the cn12 connector BUT only 1.85V for pin 4 of the cn12 connector. Here are the schematics of the PSU, pin 4 of cn12 connector should give a reading of 12V, so I guess the problem is within the psu, probably a bad cap. Cn12 connector provides power to the KLM1261 board, shall I expect damaged components within this board too ? Any more thoughts/help would be appreciated. Looks like the trimpot is for the +5V adjustment on CN9. What are you using for a ground point when measuring pin 4 of CN12? The way that part of the circuit is, pin 4 should be -12V relative to the ground on pins 2-3. Try reversing the leads on your multimeter when measuring between pins 3-4, in case your meter can't read negative voltages correctly. Other than that, the voltages seem correct when a load is applied (switching supplies need a load to regulate voltages correctly). If the -12V is still incorrect at pin 4, the problem could be in transformer T1, diode D7, inductor L4, or caps C23 and C21. Also check R21. Also, try measuring the voltage between pins 1 and 4 on CN12. You should see 24V between those pins. Hi Synthaholic and thanks again, I really appreciate it. I used pin 2 and 3 as ground and it reads 1.85V. At the moment I found out that cap c23 is bad, so I 'll replace it as soon as I get a new one. 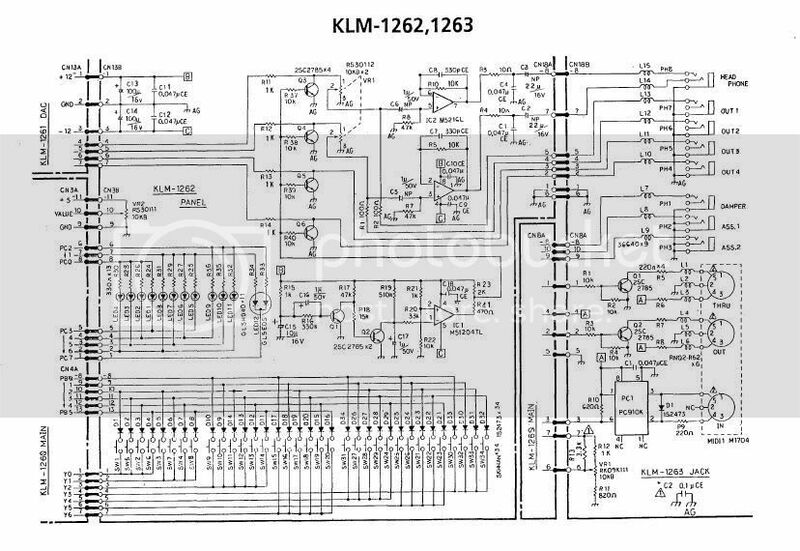 The KLM1261 is the board that the connector cn12 is connected.I dont know what is the use of this board since all chips are located in the mainboard (KLM 1266). Do you think that components in this board were affected ? 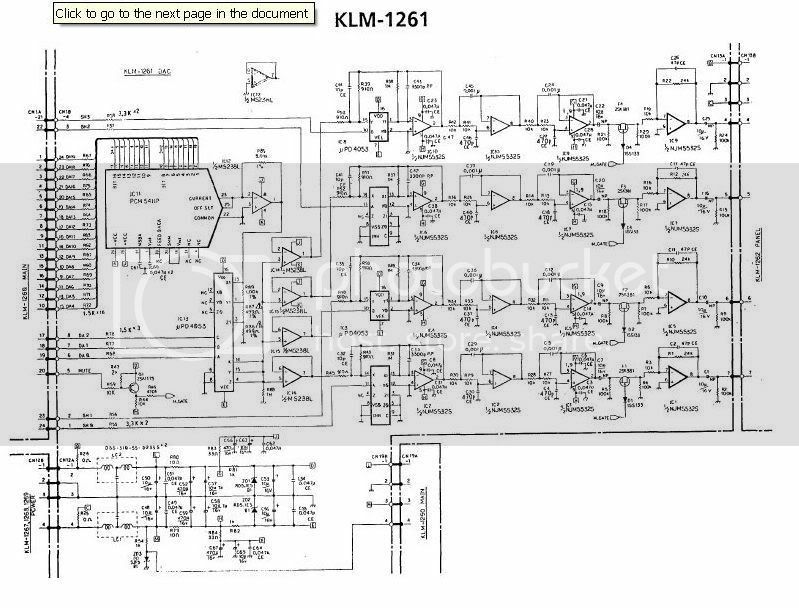 The top left side of the schematic says "KLM-1261 DAC"... so that board contains the digital-to-analog converter. If that isn't working, you'll get no sound. Get the power supply fixed and then see what you get from there. It's possible nothing else is wrong and the DAC will work properly once it gets the correct supply voltages. Thank you once again for helping me out , Synthaholic. I installed factory sounds and i am having a slightly distorted output. Most sounds play ok, but many loud patches distort like there is an internal clipping going on, that happens even when I lower the volume slider. this problem is more obvious when playing chords, as the velocities of many notes are added, sound gets easily clipped internally. 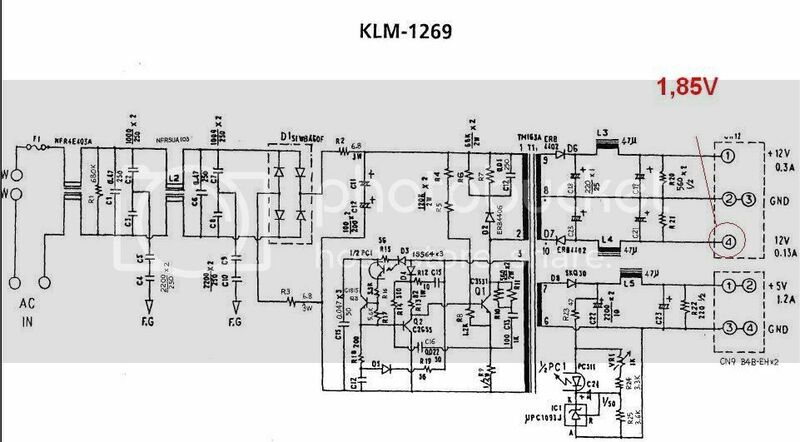 I guess that the problem is within the dac board (KLM-1261) or the dac extension that is found in the KLM-1262 board. Any thoughts about what might be causing the "internal clipping" problem ? After replacing C23 ( 220uf @ 25v) in the power supply board (KLM-1269) I noticed a discolored resistor (R79 @ 10 Ohm in the DAC board (KLM-1261), which was causing the distortion. Re: KORG M1 - No sound / Low battery indication. SOLVED! I hope everyone is still around. Im having the same trouble, check out he picture, I replaced the capacitors but need to replace the green jigamathings? What are they? can't find them anywhere, 470K J? According to the schematics , the green thingies are inductors, 47uH. Inductors rarely fail, you better replace C21 , it is bulged. yes according to the picture C21 must be replaced (the top is inflated). but the best is to do a complète recap. You have used low esr 105°C caps as replacing parts? I have similar issues with my M1. After replacing the cap on the power board, sound has returned! However, there is distortion. Did you visually check all resistors as well or test them all? Does measuring resistance change with polarity?